Most of the weapons we sell as complete rifles come with a M4, flat top upper receiver with a Mil. Standard 1913 picatinny rail. A rear "iron" sight is not included in order to keep the pricepoint low and allow customers to choose a sight or optic that best fits their intended use for the rifle. While it is always a good idea to have a BUIS (back up"iron" sight), and important to become proficient in using these, the accuracy and enjoyment an optical sight provides leads most AR owners to eventually look for an optic that will enhance their shooting experience. In this blog post, we will look at some of the "red-dot" sights offered at www.del-ton.com, and the positive or negative features of each model. DTI offers quality optics from manufacturers such as EoTech, Aimpoint, and Trijicon, as well as the mounts and other accessories that ensure you will get the most out of your optic and AR-15. 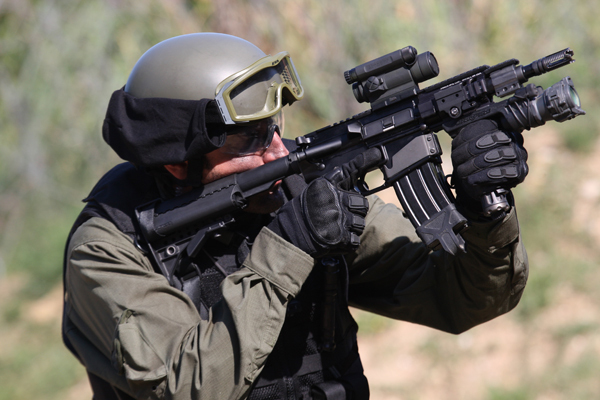 EoTech offers an extensive line of red-dot (sometimes called "reflex") optical sights. They have a very distinguishable reticle, a small 1 MOA red dot inside a much larger 65 MOA circle. This design allows for very quick target acquisition, and that is where red-dot sights really perform. If your application favors quick, accurate engagement, this optic can be a great asset . 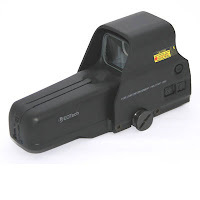 While the EoTech and Aimpoint optics do not have any magnification in the actual unit, an "add on" magnifier is available to help extend the accurate range of this optic. The main difference between the various models has to do with size and weight, type of battery used, and whether or not the optic can be used with night vision devices. The EoTech optics include a mount to install the device on your flat top receiver rail. These optics are tough, and have been battle proven by military and law enforcement units. Possible negative aspects of these optics include the reticle (some users prefer a simple, single red-dot), and a battery life that does not have the longevity of other brands if left on continuously (the EoTech has an automatic shut off feature to conserve battery life). Of course, pros and cons are highly subjective and dependent on the way the optic is used. Trijicon ACOG and reflex sights are also a quality optic to consider. These optics employ tritium for illumination rather than batteries. While slightly more expensive, this "always on" feature can be a real benefit for some applications. These rugged and dependable optics have also seen professional use and the ACOG model has a 4X magnification. They are designed for fast target acquisition, so all models have a fairly large reticle (in comparison to the EoTech and Aimpoint models). 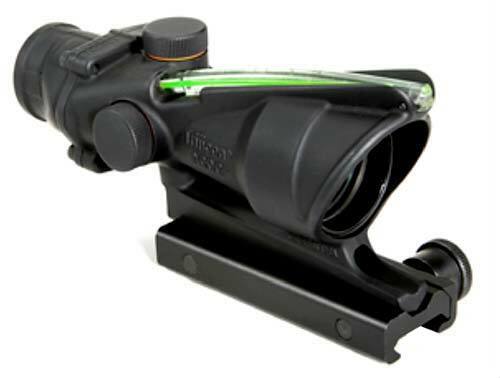 The Trijicon optics DTI offers include the factory mount. Both EoTech and Trijicon offer models with bullet drop compensating/ranging reticles. 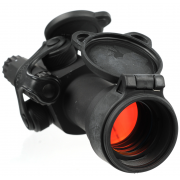 Aimpoint red dot optics have also seen extensive use in the military/LE arena, and are equally dependable. The Aimpoint reticle is a simple, 2 MOA red dot. Like the other brands, these optics provide fast, "both eyes open" target acquisition, and are parallax free. All models, but especially the newer ones with ACET technology, offer an incredible battery life. It would not be inconvenient to leave the power on for extended periods of time. This can be a great asset in a defense application, as fine motor skills can be affected when a threat arises. Not having to worry about turning the weapon on and selecting the perfect brightness level is a definite asset in the Aimpoint design. Unlike the EoTech, some of the Aimpoint models do not come with a mount, and a quality mount can increase the amount spent very quickly. While there are less expensive red dot sights that might perform just fine in a casual shooting application, these red-dot sights are well worth their cost; they can provide a lifetime of service and an enhanced shooting experience with your AR-15. If you have any questions regarding optics or anything about the AR-15 and the products we offer, please feel free to contact us.